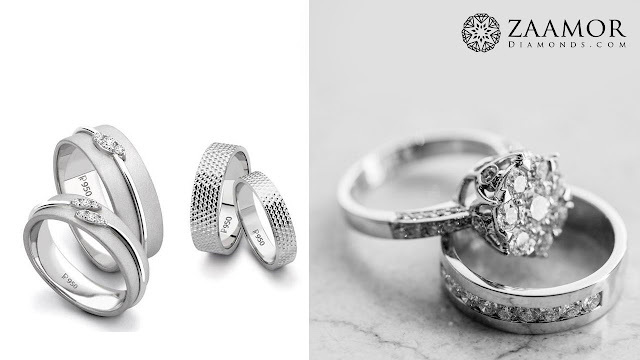 Gold and platinum are the two most commonly used metals for engagement and wedding rings. Both metals are unique, yet similar in several ways. Let’s look at how gold and platinum compare in appearance, cost, durability, and comfort. Platinum is a natural white metal, while white gold is given its color artificially by alloying gold with silver or palladium and by adding rhodium plating to it. While white gold looks very similar to platinum, over time the the rhodium plating in white gold will wear off and fade to a yellowish tinge. Once you re-polish and re-plate the white gold ring, it will look white again. Platinum, which is naturally white, will not fade to yellow. White gold is has very high reflectivity and therefore shines much brighter and whiter when new. Platinum also has a shine, but it does not last very long. The rhodium in both white gold and platinum eventually wears off giving a dull grey look, but the shine can be replaced by re-plating the rhodium. Though both gold and platinum are strong and durable precious metals, platinum is the stronger and more durable of the two. For example, the prongs holding the center stone of a platinum engagement ring are less likely to break then those of a gold engagement ring. Despite being stronger and more durable, platinum is a softer metal than 14k gold. This means it will get scratched a little easier than 14k gold would. However, an important thing to note is when gold is scratched, the gold is lost and it looks like a scratch. When platinum is scratched, the platinum gets moved from one place on the ring to another, and it develops something called a patina finish (which looks like an antique or worn ring). A lot of people love and desire the patina finish. The good thing is that re-polishing your ring will help restore the ring to near its original look for both platinum and gold. All Do Amore Rings include free lifetime polishing so if you purchase your ring from us, don’t worry, you’re in great hands. Because platinum is more dense than gold, platinum rings will be heavier than gold as well. Some prefer the heavier weight, but some find the lightness of gold rings to be more comfortable. It is really up to each individual person. One option for people seeking a comfortable ring it is to opt for one with a comfortable design, like this men’s fingerprint wedding band. If you still can’t decide between gold and platinum, don’t worry. If you have the budget, go for platinum. If you don’t, then gold is still a very precious metal and is an excellent choice. At the end of the day, all rings require some minimal upkeep and maintenance so make sure you purchase your rings from a company that has a lifetime warranty and will re-polish, clean, and re-plate your rings for free.